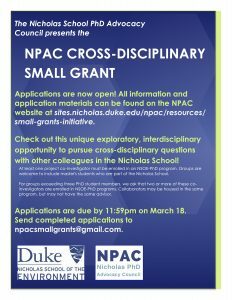 NPAC Cross-Disciplinary Small Grant Application now open! The Cross-Disciplinary Small Grants Application is now open! Please see the attached documents for more information regarding the application and required letter of support. 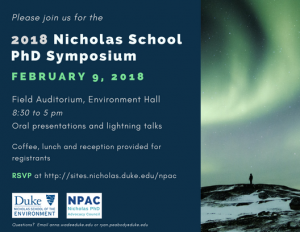 Once again, please join us for the 2018 PhD Research Symposium. Feb 9th in Field Auditorium, Environment Hall. View the schedule here: PhD Symposium Schedule. RSVP here by Monday, Feb 5th.